Geotextile Market size was over USD 4.5 billion in 2016 and industry expects volume consumption to exceed 10 billion sq. meters by 2024. Positive application outlook in construction, agriculture, erosion control, and drainage should drive geotextile market size. Shift in consumer preference regarding usage of biodegradable material consumption should fuel product demand. Increasing synthetic polymer based product development has led to positive outlook in construction industry. It is mainly used for constructing road, railways, highways, tunnel, bridges, and airports. Increasing construction spending in China, India, and Indonesia along with favourable government support regarding infrastructural development should drive industry growth. China construction market size was valued at over USD 740 billion in 2016. Rapid urbanization along with progress towards central National New-Type Urbanization Plan may enhance industry growth. Chinese government is focusing on green building projects to reduce GHG emissions and conserve resources, which should drive regional industry growth. New commercial building market share accounted for over 55% of the total demand in 2016. 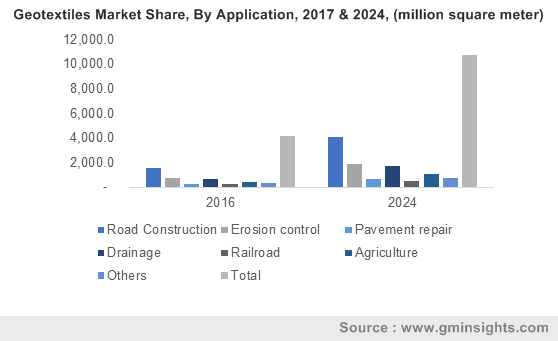 Geotextiles market size has positive outlook in sub-grade improvement of railway tracks owing to good elongation, abrasion resistance and permits passage of water through it while retaining soil granules. In February 2017, China announced USD 17 billion investment in railway expansion in central and western region. Expanding transport facility will increase employment, avoid economic contraction and maintain GDP, thereby promoting infrastructural market size over the forecast timeframe. UK, Germany France, Italy, and the U.S. has imposed strict regulations on municipal solid waste (MSW) management, which will drive geotextile market size. American Association of State Highway and Transportation Officials (AASHTO) designed standard specification and drafted installation guidelines for application in separation, drainage, pavement, slit fencing and erosion control program. This will reduce road construction time which in turn leads cost reduction. It prevents crack formation and restricts water percolation, thereby protecting soil subgrade. In addition, Indian National Highway department is planning infrastructural expansion by undertaking 13,000 km highway & road development plan and promote these products to be used in the projects. Geotextile manufacturers and users have jointly developed Maximum Average Rolling Value (MARV) standard, which assures quality & good manufacturing practices and play vital role in consumer purchasing decision. MARV indicates product quality variance and acts as quality tool, which determine its specification conformity. MARV value signifies 97.5% confidence level thereby minimizing sub-standard product. Similarly, California Bearing Ratio (CBR) indicates soil strength and the rating indicates load bearing capacity. It is mainly used for non-woven, composite and geo-membrane materials. This method determines puncture resistance and radical tensile strength. Adoption of MARV and CBR will standardize product quality and promote technological development. Key raw materials, polypropylene, polyester and polyamide are used in synthetic polymer based product manufacturing process. Fluctuating raw material prices may challenge industry profitability and affect geotextile market price trend. Synthetic based fibers for these products are made up of polyester, polypropylene, and polyethylene. 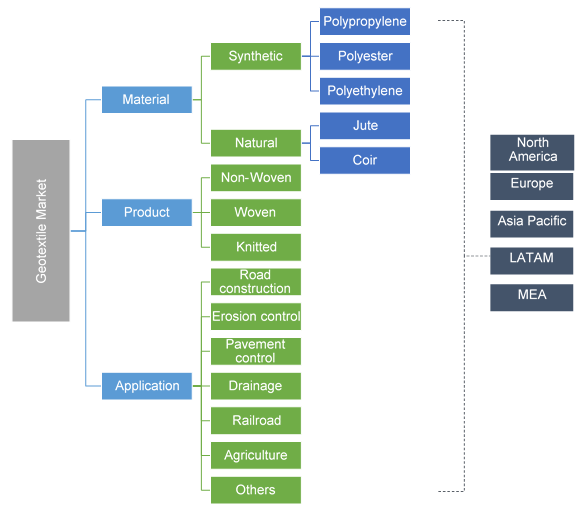 Polypropylene based geotextiles market size should expect gains at over 11%. It is widely used in road construction owing to its high availability and longer life span. They possess high strength which have maximum slope support, erosion control, and stabilization. Jute based products has emerged as a strong alternative to synthetic material for various civil engineering applications. Jute geotextile market size is poised to reach over USD 200 million by 2024. It is effectively used in erosion control situations including bridge abutments, culvert and table drain outlets, river banks & canals, residential and airport areas, sports field restoration, and railways & road slopes. It is also suitable for fabrifoam, wickdrains, and asphalt overlays. Nonwoven geotextile market size should surpass USD 8.5 billion in sales by 2024. Increasing application in drainage, filtration, separation, and road construction owing to high chemical resistant and UV finish properties along with withstand against environment dynamics should drive industry growth. They are moderately lightweight fabrics weighing from 120 gm to 250 gm per square meter. Woven geotextiles market size may witness highest gains at over 11%. Strong application scope in erosion control and road stabilization owing to hydro filtration and high tensile strength properties should favor industry growth. They are mainly constructed through the weaving and blending fibers. Geotextile market size from road construction applications should exceed USD 4.5 billion by 2024. It is widely used for laying roads to strengthen soil thus resulting in longer road lifespan. Increasing construction spending in China, India, and Russia owing to strong infrastructural development should favor industry growth. Favorable government regulations regarding usage of jute in road construction should fuel product demand. Geotextile market size from erosion control applications may witness significant gains at over 10.5%. Erosion caused by floods, tsunamis, excessive rainfall and water encroachment may hinder the industry growth. It helps holding the soil and promotes vegetative growth to mitigate soil erosion. It is used for coastal erosion protection, slope reinforcements, and strengthening dredged soils. Geotextile market size from drainage applications may witness gains at over 10%. Increase in infrastructure development mainly in Germany, UK, and France should have a positive influence for the industry growth. These layers are used in civil applications to remove fine particles or moisture. Europe geotextile market size, led by Germany, UK, Italy and France should witness significant gains at over 9%. Increasing construction spending owing to roads, airports, housing, railways, and ports development should drive regional growth. Rail and road authorities have published various norms and standards for solid waste collection and waste water treatment. China geotextile market size should witness an increase in demand owing to rise in government spending for various upcoming infrastructure projects. Increasing environmental standards along with rising consumer awareness should favor regional growth. Brazil geotextiles market size should witness significant gains at over 11.5% by 2024. Implementation of Growth Acceleration Program (PAC) by Brazilian Government regarding new infrastructural development should drive regional industry growth. Approximately, 12,000 infrastructural projects are initiated which will enhance industry growth in filtration, soil reinforcement and drainage applications. Global geotextile market share is fragmented. Some of the companies operating in the market include Royal TenCate, GSE, Fibertex, Hueskar, TENAX, and Typar which cater to domestic and regional market. Companies are focusing in business expansion across emerging regions along with setting up new plant for increasing production capacity. Geotextile is a human-made permeable textile, which increases soil stability, prevents rut formation and checks erosion. It is a subcategory of geo-synthetics and produced from natural and synthetic fibres. Rise in road construction due to increase in government initiatives and projects may fuel industry growth demand. They are prefabricated in large sheets and installed quickly, thereby reducing road construction time. It reduces environmental damages triggered by quarrying, material handling equipment, trucking and natural resources including rocks, stone and sand excavation. Polyester based products increases soil grade stability as it is heavier than water and possess excellent creep and strength properties. It permeates water and checks road weakening by infiltrated water. Subgrade stabilization and base reinforcement improve road construction life.